One. Hundred. Million. downloads. Only three have accomplished this feat. In a world where it seems like anyone can get famous for doing anything, the numbers don’t lie when determining who is the most popular. The RIAA (Recording Industry Association of America) gathers sales and streaming data to certify songs and albums gold, platinum and even diamond, and in doing so, the organization can also keep track of which artists have officially moved the most music. The group used to only concern itself with which titles sold the most, but now that streaming is a part of the methodology that certifies a piece of music, it’s about moving equivalent digital units. Leading the way in downloads is Rihanna, who is in a relatively distant first place when it comes to single shipments. 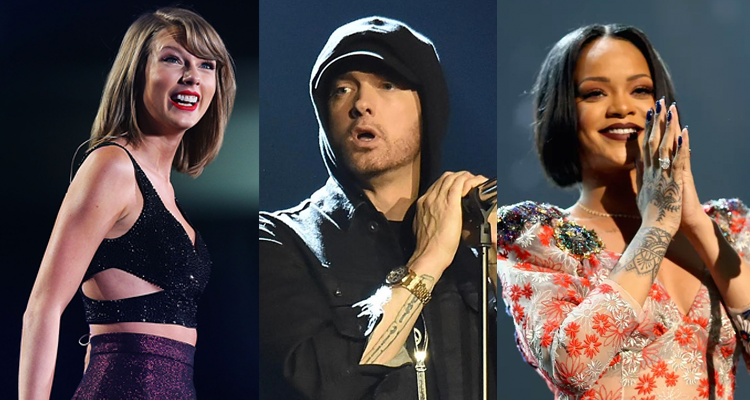 The singer-songwriter has moved a certified 124 million single units in the U.S. Taylor Swift is next and can claim 108.5 million single unit shipments in this country, which puts her just one platinum certification ahead of the next name, Eminem. The rapper has now shipped 107.5 million single units in the U.S.
Katy Perry is close to cracking that 100-million units milestone, and is currently sitting at 98 million.